The Journal of Social Structure did a special online Visualization Symposium with peer-reviewed network visualizations. A good format, a great idea, and some nice viz examples. Hopefully next time there will be more submissions. My submission was cleaned-up interactive version of the bill-endorsement network from MapLight data with click-through to bill summaries. The layout was produced using SoNIA (now with variable node label sizes!) and the MDSJ library. Michael Heaney and Fabio Rojas just released another great network map in a blog post. 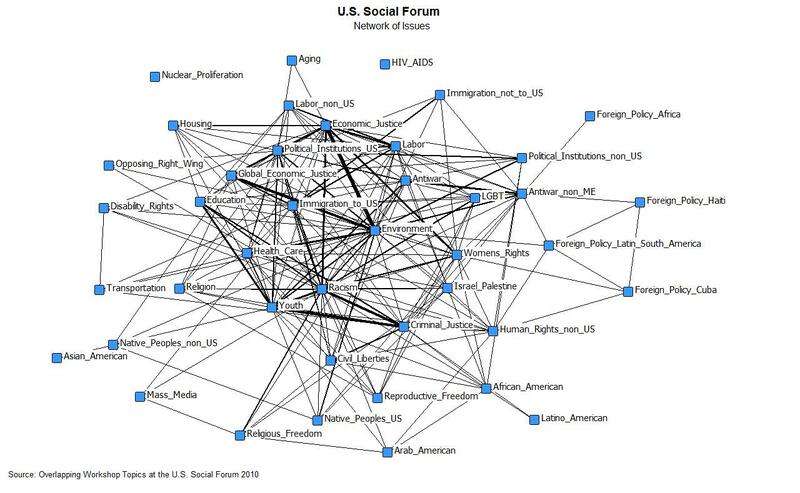 This one shows the co-mentions of topics (as coded by the researchers) appearing in the descriptions of panel discussions at the recently concluded 2010 US Social Forum in Detroit. The map functions as a coarse-grained representation of interconnectedness of the various topics, and presumably how important and relatively central they are to the activists and organizers participating in the forum.